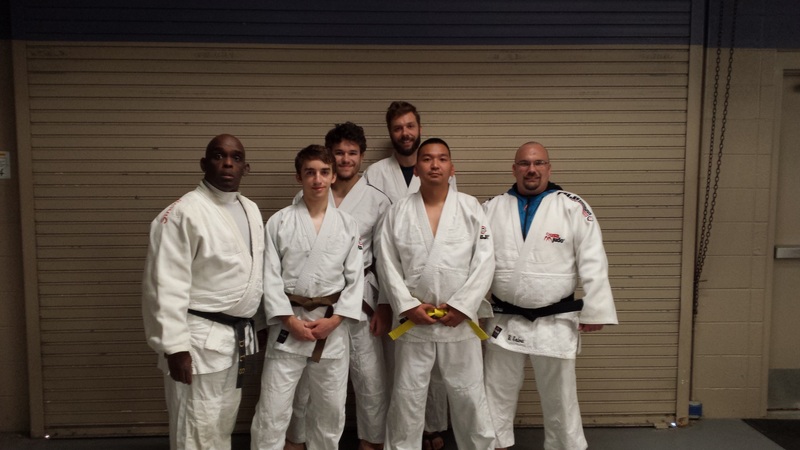 White Dragon Judo Club takes great pride in giving back to their community. 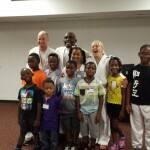 On July 18, 2016, members of the dojo with Sensei Demonn Smith conducted a judo self defense demonstration for the Mighty Kids Ministry of Peoples Christian Community Church. Sankyu Rob Handshy and Bobbie Jo Ridenhour helped to teach practical judo techniques used for the street. These techniques are simple and can save a person’s life one day. Sensei Smith expressed the benefits of judo as a way of developing physical fitness, self discipline, self-confidence, concentration, and leadership skills. Most important Sensei Smith talked about judo as way of developing self respect and respect for others. 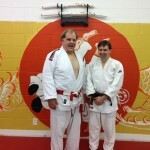 He stated that judo is fun and is for everyone of all ages. If you would like to know more about judo and self defense classes at White Dragon Judo Club, feel free to checkout our website and Facebook pages. We look forward to hearing from you and we will see you on the mat. White Dragon Judo Club hosted a judo open mat session on July 4, 2016. Judo open mat session are open to members of the club and non members. There is no mat fee just wear the proper judo uniform. The practice was led by Dan Raney. Sensei Raney demonstrated Uchimata. He showed different versions of the technique. Sensei Raney had our student practice practical drills that would improve their entry and execution of the technique. The session was concluded with tachiwaza and newaza randori. Are looking for a dojo? 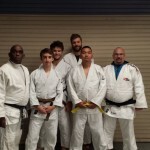 White Dragon Judo Club has a full roster of great instructors that will give you the proper direction in the martial art of Judo. There are many learning opportunities like this one. All it takes is a commitment to the martial art and most important, yourself. The monthly rates are affordable and you are never too old to start. Join the club. We will see you on the mat. The 21st Tohkon Classic took place at the Oak Lawn Park District Pavilion in Oak Lawn, Illinois on June 11, 2016. 7th dan Randy Pierce assisted in the officiating of this tournament. Demonn Smith was the player/ coach for Team White Dragon. This tournament has proven to be one of the most competitive events of the year for Team White Dragon. The margin of error was slim to none. Adam Young showed significant improvement in this tournament scoring a win in the preliminaries but was unable to advance to the medal stand. It was an enlightening learning experience for gokyu Tsengee Erdenebayer. Robin showed lots of potential and made the best of his opportunity by scoring a bronze medal in his tournament debut. Byron Helmrich got off to a slow start but came on strong in the end. He did not qualify for a medal. Phillip Vojta scored wins against some credible opponents. He took bronze in his category. Bryan Enlow won the only gold medal for Team White Dragon in this tournament. He went 4-0 on the day. Demonn Smith showed signs of returning to mid season form with a solid performance. Smith took bronze in the veteran’s heavyweight category and silver in the open division. 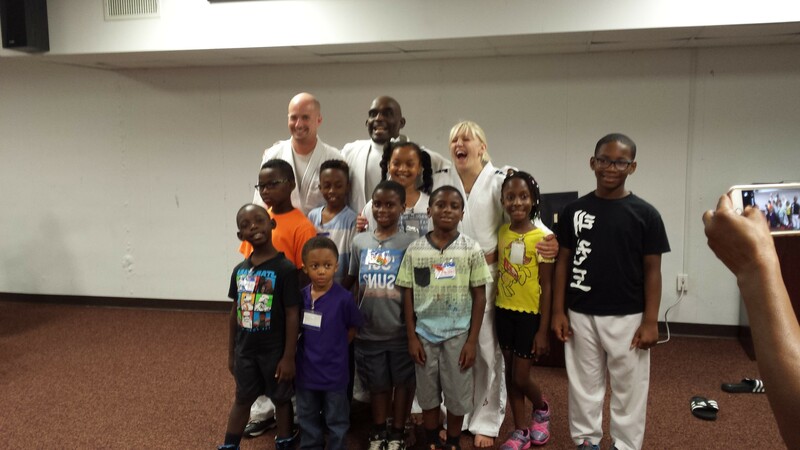 White Dragon Judo Club conducted its first promotion day in quite some time. 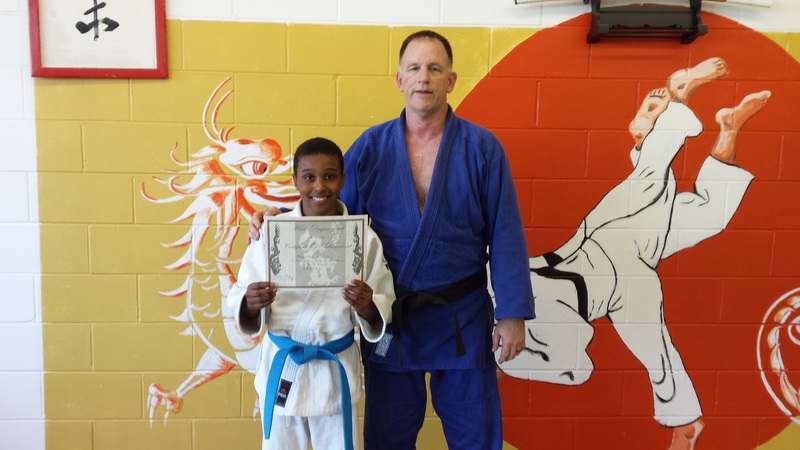 With Dan Raney, Demonn Smith and Andrew Lazarz presiding, newcomer Manareldeen Fajors was promoted to Blue belt on June 5, 2016. The Palo Alto, California native is a grappling dynamo. Manareldeen also competes in wrestling and Brazilian Jiu Jitsu. 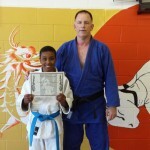 The youngster displays great athleticism, work ethic and discipline that is rare these days in a junior class judokas. Manareldeen recently took gold at the 2016 North South Judo Tournament. He was also awarded the Fighting Spirit Award for his awesome performance at this tournament. Since then the preteen continues to push himself to be a better version of himself. Manareldeen’s star potential is limitless. 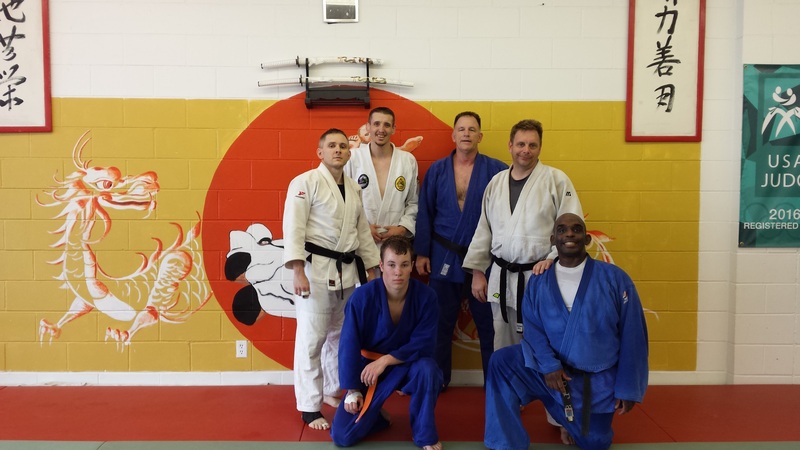 Ryan Morrow was promoted to Nikkyu on Wednesday, May 25, 2016. Morrow started judo at age 9. 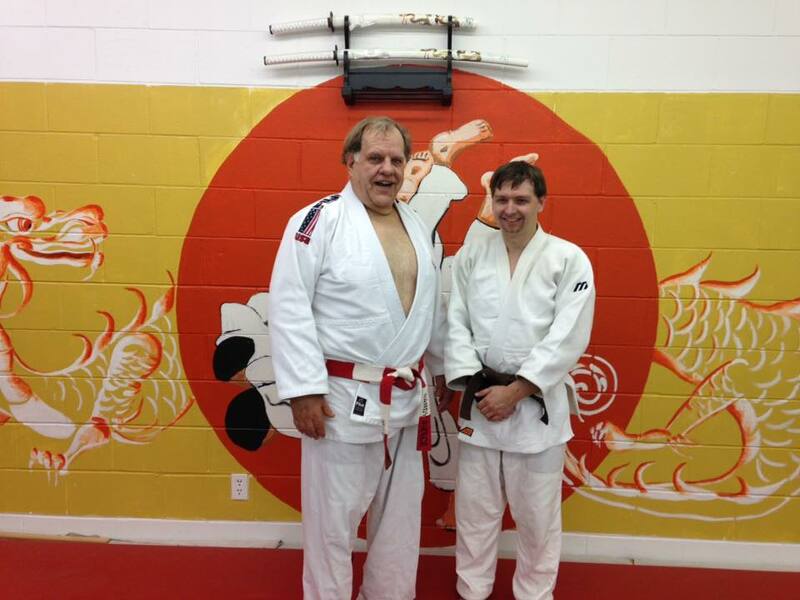 He made his return to the practice after watching his son participate in the junior judo classes at White Dragon Judo Club. This year Ryan has dedicated himself to being a great teacher, passing down his judo knowledge to the youths. His patience and charisma is contagious and it shows in his students. 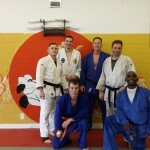 Are you someone that has practice judo and would like to get back into it? What are you waiting for? There is plenty of room in our adult classes. Do you have a son or daughter? Why don’t you enroll them too? You are not too old and it is not too late. Ryan will see you on the mat. 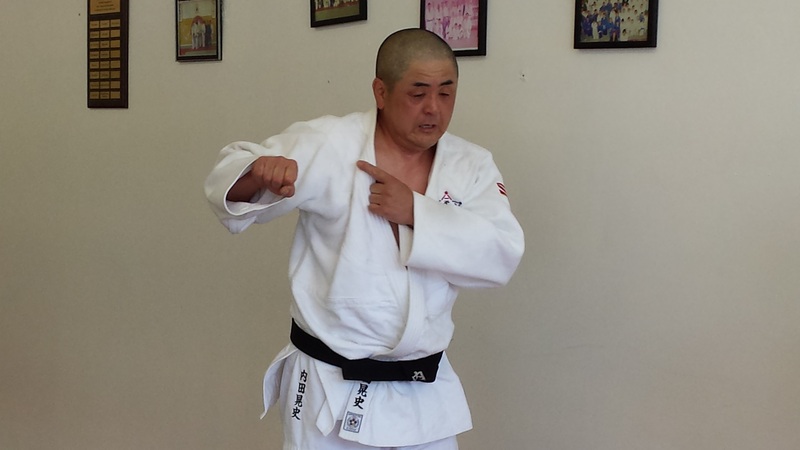 Koji Uchida was the guest instructor for Saturday judo practice at White Dragon Judo Club on May 21, 2016. Uchida is a Sandan, third degree black belt in Judo. He started judo at a very young age and became a prominent judo player during his high school and college days in Japan. Koji now resides in Seattle, Washington. The practice consisted of a strong emphasis on the fundamentals. 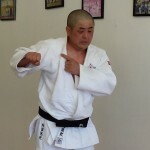 Uchida stress the fundamental concepts of kuzushi, off balance. Sensei Uchida also demonstrated a counter to tai otoshi, ko soto gari. The session was followed up with nagekomi and randori. It was a technically enlightening experience.